Getting a baby to sleep through the night can be more simple than you think. It takes consistency. It takes thought and effort. It takes paying attention to details. It can require some effort on your part. It can all be done! 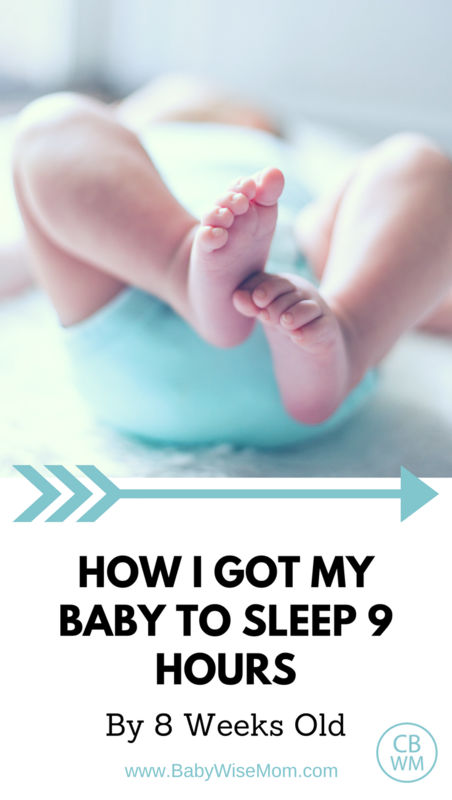 Here is how I got my baby to sleep 9 hours at night by 8 weeks old. I started a nice, consistent routine from birth. No matter the age of your baby, work on getting a nice solid routine each day and night. You don’t want to turn rigid and not allow for flexibility (growth spurts and sicknesses happen), but you wan to be as consistent as is reasonable. Have regular feeding intervals. Have some playtime after each feeding. Have regular naps. Many of the following tips will delve further into this overarching concept of having a solid routine. This is the hard one to do when you have a young baby. Decide on a reasonable morning wake up time and get baby up at that time each day. Stick to a 30 minute window. I don’t mean 30 minutes on either side. 30 minutes total. If you are aiming for a 7 AM wake up time, your 30 minute window might be 6:30-7:00. It could be 6:45-7:15 or 7:00-7:30…choose a 30 minute window to go with your wake up time. I get my babies up at the exact same time every morning. I only tap into that window when I MUST. While I am waiting for baby to sleep through the night and establishing this consistency, I am as consistent as possible. Do not underestimate the importance of this step. I know it is hard some mornings. Baby is sleeping and you want to let baby sleep in so you can, too. I promise it pays off. 3-Do bedtime at the same time each night. Just as you have morning wake-up time at the same time each morning, have your bedtime the same time each evening. Again, allow the 30 minute window as needed. Days can vary, and it can make bedtime a tricky thing to keep consistent. Stick to this 30 minute window. If your day got way off and you ended up feeding baby at 5 PM instead of 4:30 PM and usually do bedtime at 7:30 PM, stick to your same evening feeding and bedtime. 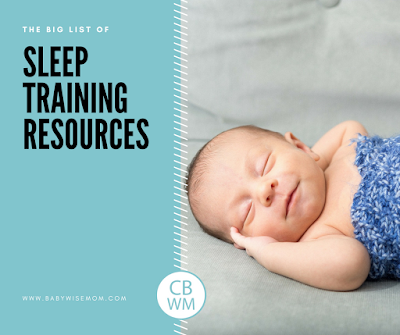 A key element to both the Babywise method and the Baby Whisperer method is to feed baby, have baby play, then have nap time. This method works for a few reasons. One is that you are being mindful about making sure baby has some time awake consistently throughout each day. Baby gets those awake hours during daylight hours, not nighttime hours. This method also helps ensure baby eats well at each feeding. You aren’t feeding baby to sleep, so you are working to keep baby awake to eat. If you feed your baby to sleep and she falls asleep after 2 ounces, but she really ideally would be getting 4, she will have gotten 2 fewer ounces that feeding. Those ounces need to be consumed at some point. If that doesn’t happen during daylight, it will happen at night time. This pattern also helps you make sure your baby has regular and consistent naps. A great paradox of babies is they they do not sleep better if they are deprived of sleep. They sleep worse. The better rested your baby is throughout the day, the better she will sleep in the night. Babies need a LOT of sleep. They need several naps each day (the exact number depends on the age). If you are doing the first 6 things I listed above and baby is not sleeping through the night, the final step is to problem solve. The trick is to figure out why baby is waking in the night. Once you know why, you can know what to do about it. Baby might not be sleeping through the night because she is still hungry at night. If that is the case, you need to see if getting more food in during the day is possible. It might not be yet. A tummy can only hold so much at a time. Feeding more often might help add another feeding in the day. Cluster feeding might help. Sometimes, you have to just wait hunger out. Baby might be hot or cold, making it difficult to sleep through those transitions. Baby might have reflux or gas pain. Baby migiht not like having a wet diaper. 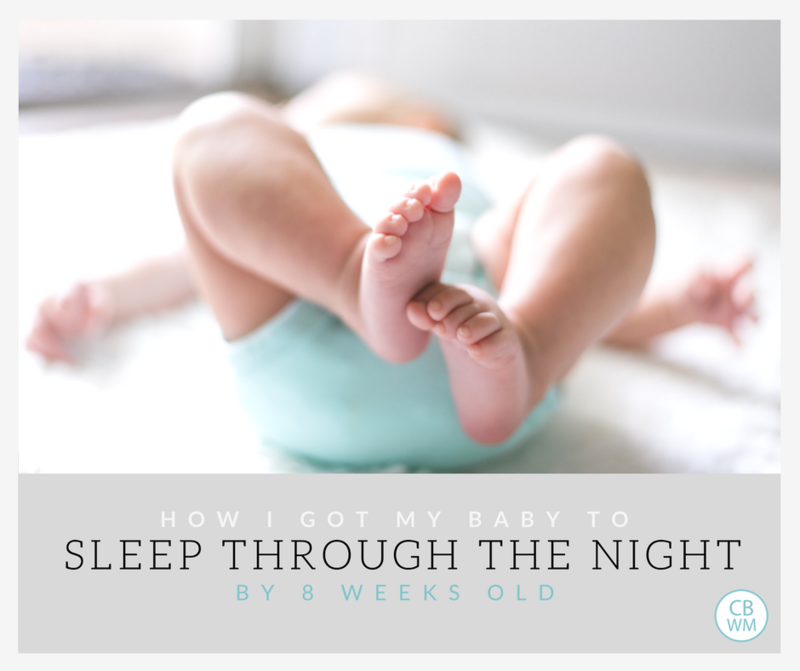 I have a whole post with common reasons why baby wakes in the night and what to do about it. Check that out to help problem solve. It is very helpful to take notes as you problem solve. It helps you track the details. These seven steps will help you get your baby sleeping through the night. 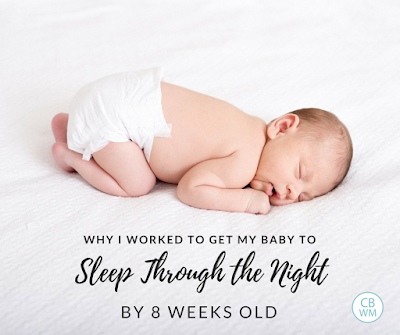 Take note that a baby needs to be old enough to sleep through the night consistently. Babies under 5 weeks should typically eat at least every 5 hours through the night. By 7 weeks old, baby can be up to 7-8 hours between feedings if baby can handle that. Some babies can’t go very long between night feedings for a while. Be patient with your individual baby’s needs.